With the newest codec H.265/(HEVC) coming out for a long time, have you ever enjoy the nice H.265 movies on your handle devices or media players? Is that cool? Up to the present, it seems that there are two kinds of camcorders that can shoot this H.265 Videos, Panasonic GH4 camcorder and Samsung NX1 series, right? While in order to have a nice enjoyment with this codec, we would like to introduced you newest H.265 Video Converter for you! This upgraded H.265 Video Converter is the professional and easy-to-use Windows video converter, which is specially designed for Windows users to easily convert between various video formats including HEVC/H.265, MP4, MOV, MKV, AVI, MPEG, Xvid, DivX, H.264, 3GP, WMV, FLV, MOD, TOD, WTV, MXF, MVI, F4V, WebM, VP8, 720p, 1080p, 1080i HD, AVCHD videos and more, convert between various audio formats including APE, MP3, AAC, AC3, WAV, WMA, and even extract audio from movie files. Fixed the bug of breakdown when importing MXF and XAVC format. H.264 Baseline/Main/High, three standards are all supported well. More details about this upgraded version you can open here: H.265 supported! 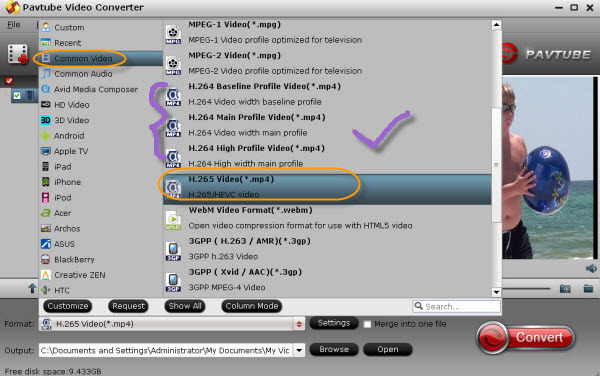 Moreover, the powerful Mac movie converter is equipped with more advanced features, which can help you preview the movie before converting, capture images when preview, convert any movie segment, crop the video black margin, automatically shut down the computer after conversion, convert files in batch mode, merge movies, and more. As the following screen shot shows, we added the H.265 Video’ for your choice, do you wanna have a try? Source from: http://www.pavtube.com/The smaller size as possible with unnoticeable differences, H.265(HEVC) has indeed brought us a lot. What’s more, the upgraded Pavtube Video Converter could bring us more surprises. Don’t forget to look forward the H.265/HEVC function of next version with Mac products! It will not be too long there! Seems to manage a large number of formats. I used it to convert H.265 files to .mp4. Very simple to use, just select an output folder, put your files to the list, click a start button, and let it run, all will be done in seconds. Great product! Apart from normal features, Pavtube can also encode H.265 videos on Windows and It works quite well. I like its batch convertion function. When the convertion starts, I can go out for a walk and get what I want when I come back. I am really happy to read this blog posts which carries lots of valuable data, thanks for providing these information.